What if our goal is to minimize customer changes during the demonstration/proof of concept stage? I am going to demonstrate Catchpoint performance measurement service to achieve this goal. Well, let’s take one step further to avoid ANY customer changes! 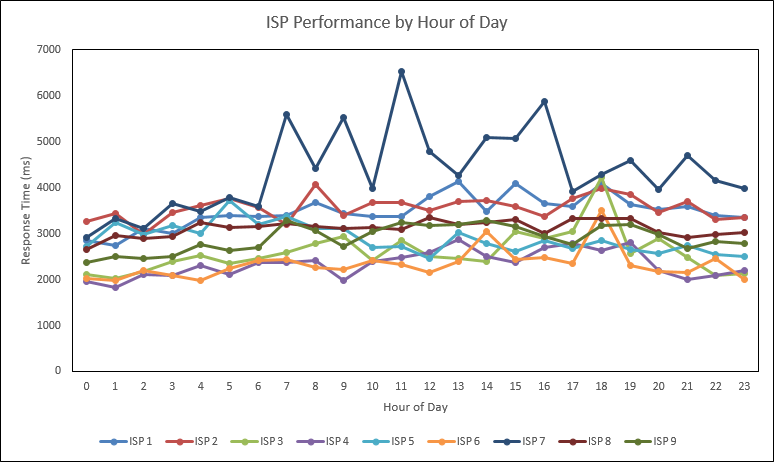 Catchpoint is one of the popular performance monitoring services. Many enterprises and cloud service providers buy Catchpoint solutions to monitor their websites and Internet services. Hello! This #WebTortoise post was written 2013-MAR-31 at 09:35 PM ET (about #WebTortoise). 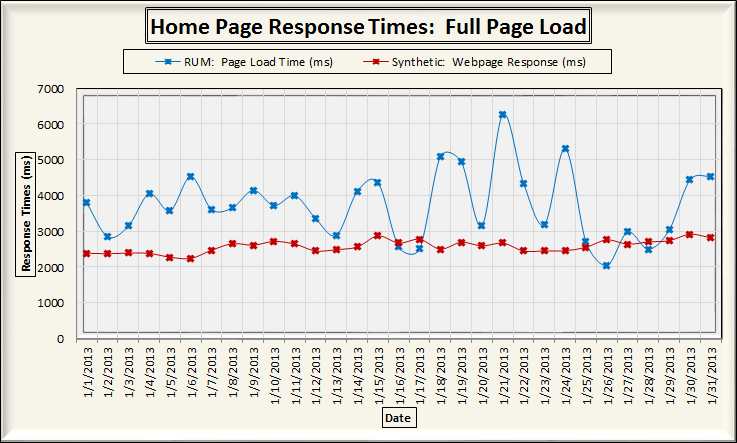 Question: How do I tell if the Response Time of my website is affected by traffic load (e.g. peak versus non-peak)? 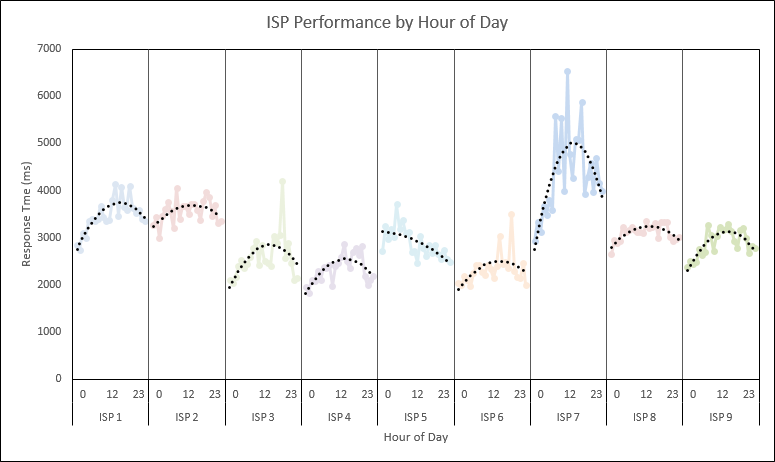 Answer: Use an Hour of Day chart to correlate whether or not web traffic load affects Response Times. 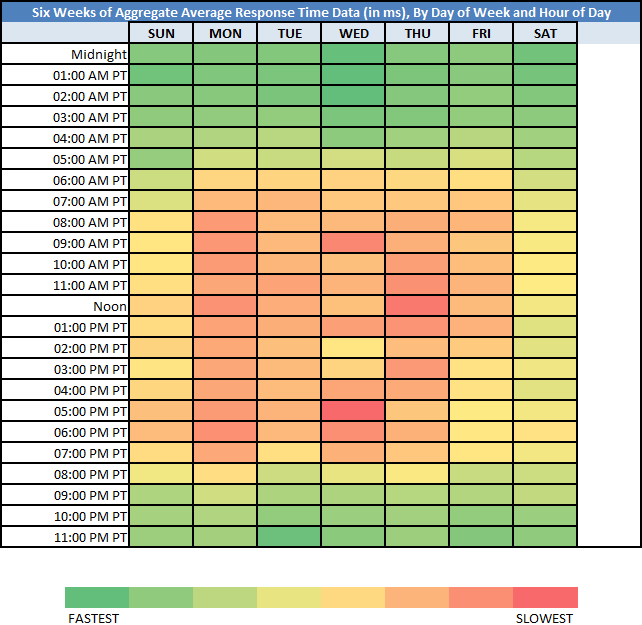 These non-time-based dimension charts allow you to aggregate data over more than one day if, for example, you wanted to look at several days/weeks/etc., but without having to plot several data in a time series. 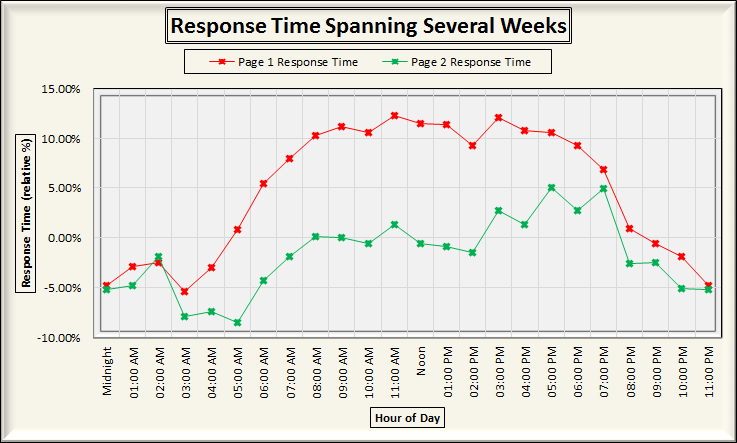 A traditional time-based line chart may very well answer the asked question. However, at times, may be easy or necessary to look at long periods of time by Hour of Day, especially if there are subtleties to discover. In these examples, are being looked at three months data. Consider the following two statements, which convey the same idea of change each in a different way. ABSOLUTE:  Our sales went from $1 last year to $2 this year! RELATIVE:  Our sales increased 100% year-over-year! 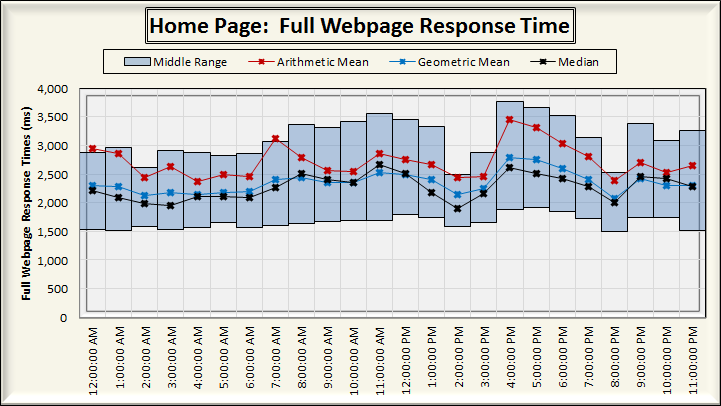 In this Webtortoise post, will look at Response Times, as they vary through the day, in both Absolute (chart 2) and in Relative (chart 3) terms. The effect of saying the same thing in a different way may be more profound, but must “remember to remember” the context of the overall picture. 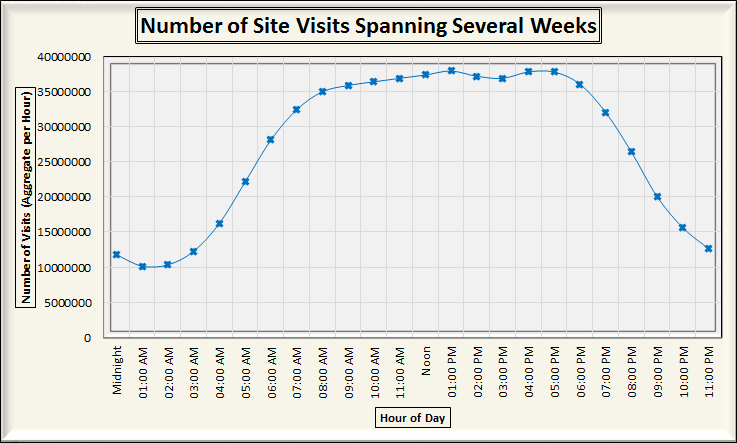 Hour of Day charts, similar to Day of Week, Minute of Hour or other non-time-based charts are powerful ways to analyze the Performance and Availability data of your website. Was asked this question and, in researching, discovered a particular page performing worse than intended, especially compared to another like page on The Company’s site. This first chart shows the average number of hits (for a 3-month period). 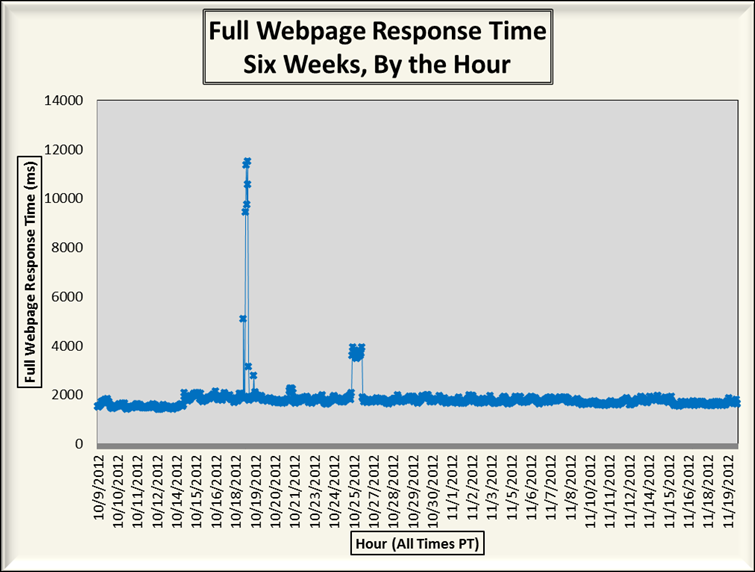 This second chart shows the Response Times for two pages on The Company’s site (for the same 3-month period). 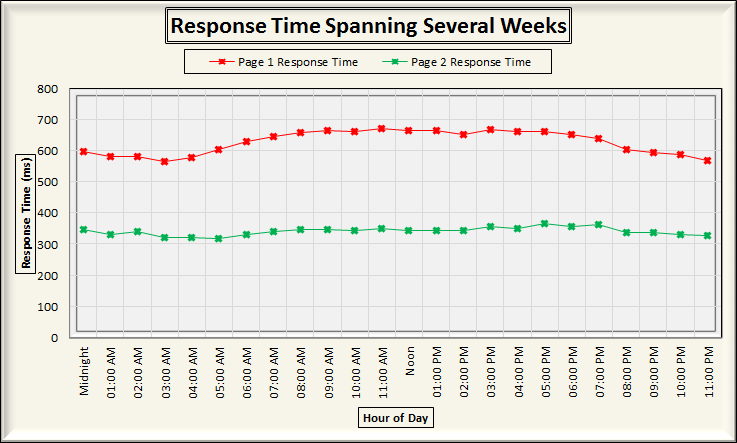 This third chart shows the Response Times for the same two pages as in Chart 2. 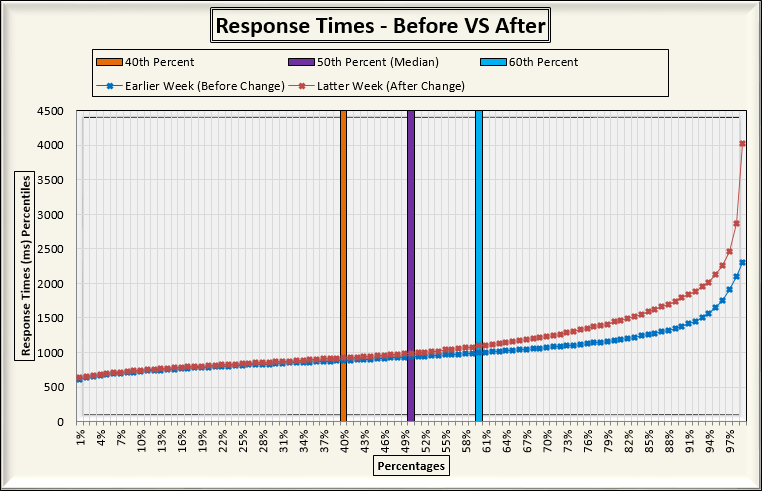 In this chart, however, the Response Times have been converted to percentages to make them relative on the same scale. 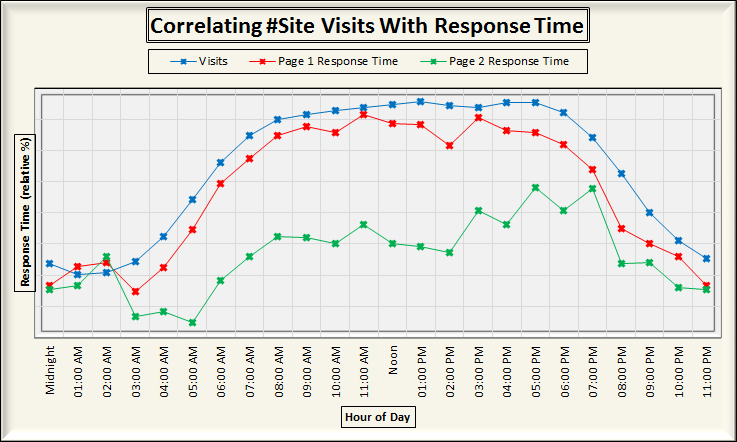 This fourth chart shows all three chart series in one location, with the # Visits on the Primary Axis and the Response Times on the Secondary Axis. Fair warning, this chart is misrepresenting because [intentionally] was removed the Primary and Secondary Axis labeling to avoid confusion. Now, are talking about the second and third charts for a moment. Because Page 1 and Page 2 (on the second chart) are on the same Y axis, was not so easy to see Page 1 performing substantially worse during peak traffic. However, when changed to a relative % in the third chart, was more easily able to see the Performance delta. Hello! This #WebTortoise post was written 2013-FEB-28 at 06:15 PM ET (about #WebTortoise). #- Consider the instrumentation of different Performance measurement tools before looking at their respective measurement data. #- Measure web assets (e.g. websites, pages and/or apps) as an output of many different inputs (In Webtortoise World, we are talking about Real User Measurements (“RUM”) and Synthetic Measurements). Use these external, outside-in measurements to complement what is done internally. #- The Response Times of the different Performance measurements are relative to a number of factors (e.g. distance, geography, browser cache, versions, infrastructure, application, ISP, CDN). These factors may also be different for each web asset. 03. It has a good mix of both cacheable and non-cacheable asset/object calls. In this post, the RUM data comes from Google Analytics and the Synthetic data comes from Catchpoint (thank you Google and Catchpoint). The RUM settings have been filtered to Geography=United States and Browser=Internet Explorer. Have also taken the metric ‘names’ directly from each provider, so folks may reference respective definitions themselves. 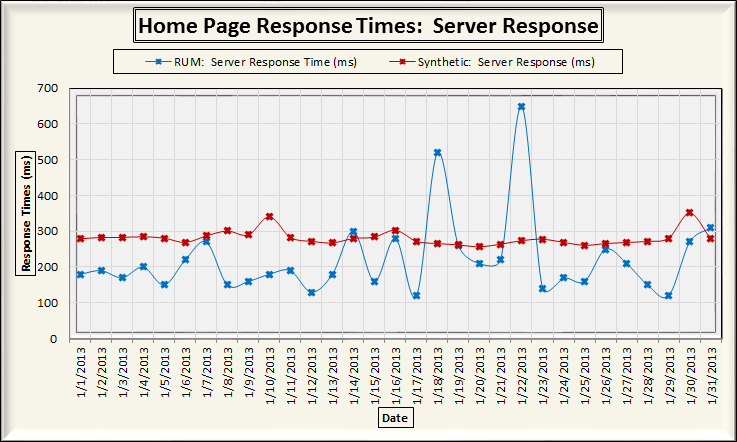 Should not be surprised to see the RUM Response Times are higher than Synthetic Response Times. Was curious, though, why the RUM times on occasion dipped below the Synthetic times. After looking around, found GeoDB to be the culprit. Was a bit surprised the RUM times here were lower than the Synthetic times. After looking around, discovered the RUM ‘Server Response Time’ did not include redirect or connect times, where the Synthetic ‘Server Response’ did. When looking at these charts, one could almost remove the Y axis values and look at the lines by themselves. Did the next value in the series increase, decrease or remain the same versus the previous value? If there was a change, was it sustained or was it transient? 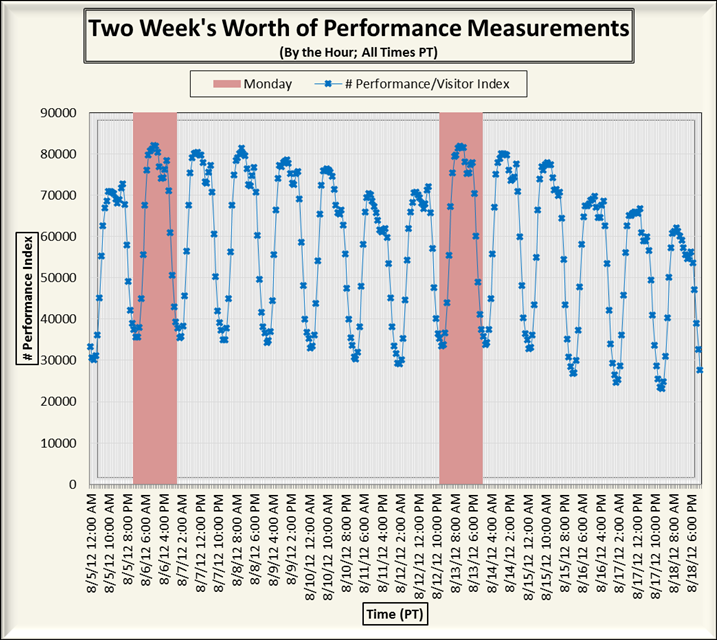 Here’s where is considered the instrumentation of your Performance measurements, to figure what may cause the hills and valleys. Remember, “If you do not measure Performance, then Performance will not be measured”. May or may not always be able to tell why the Response Times change, but that’s part of the fun! Hello! This #WebTortoise post was written 2013-JAN-31 at 09:06 PM ET (about #WebTortoise). #- An Arithmetic Mean will, for all intent and purpose in WebTortoise World, result in a higher value than its Geometric Mean counterpart. Relative to “faster is better” in web performance, might say an Arithmetic Mean is a pessimistic calculation. #- A Geometric Mean will, for all intent and purpose in WebTortoise World, result in a lower value than its Arithmetic Mean counterpart. Relative to “faster is better” in web performance, might say a Geometric Mean is an optimistic calculation. #- See, “How do I calculate the Geometric Mean in Excel”? Had an opportunity to discuss which statistical calculation should be used when looking at Performance charts. The discussion summary goes something like this. If, in fact, looking for spurious outliers, consider plotting the Arithmetic Mean average. Otherwise, consider plotting either the Geometric Mean or the Median, as they are very good central-tendency calculations. 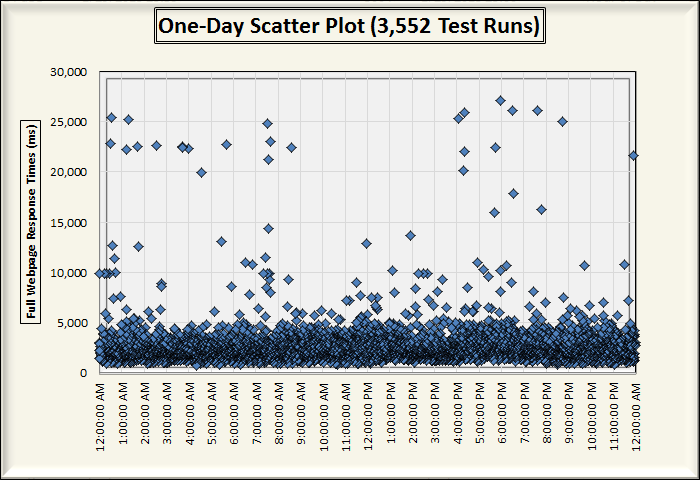 To start, see this XY scatter plot taken from a day’s worth of synthetic test runs. In this Story, are using data from Catchpoint’s US node network (Thank you, Catchpoint), measuring @ 3,500 times a day (about 170 per hour). Intentionally chose this webpage as it contained a third-party ad network having particular host issues (the waterfall data was invaluable for troubleshooting, but that’s a Story for another day). Eyeballing the chart, notice the thick band of majority data is less than 5,000 ms (right around 1,500 – 3,000 ms) with thinner pockets and bands throughout. 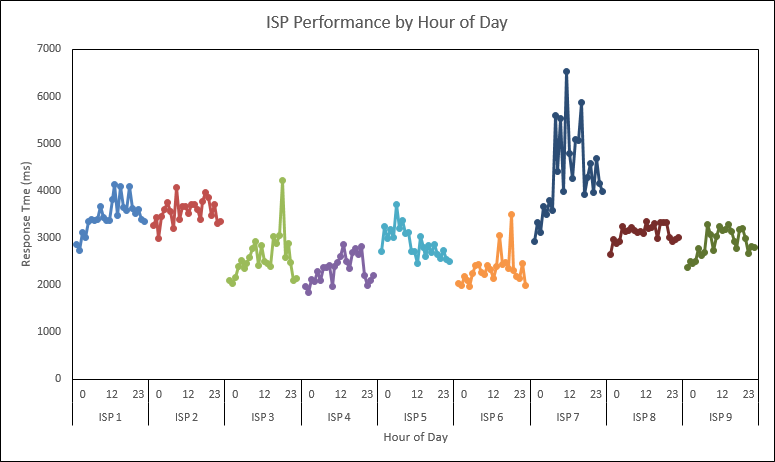 Also notice around between 10:00 AM – 02:00 PM, there were no measurements higher than around 14,000 ms.
Second, will take the above XY scatter plot and draw a bar graph representing the middle 25th-75th percentile range (See, “What is a Percentile”). The idea here is to show a middle range (which might better represent overall Performance) versus just a single line (which can sometimes ‘lie’ or misrepresent). Third, using the same data from the XY scatter plot, overlay line charts showing respective Arithmetic Mean, Geometric Mean and Median calculations. Critical thing to notice is the height of the Arithmetic Mean (Y axis) versus either the Geometric Mean or the Median. Notice how the Arithmetic Mean is, at times, either very near the upper limit of the middle range or, in some cases, even above the upper limit of the middle range! Now notice the Geometric Mean and Median are always comfortably between the middle range. Notice the 12:00 AM and 07:00 AM hour’s Arithmetic Mean is above the Middle Range. Now, quickly glance back at the XY scatter plot to see the measurement data. Notice the middle range for the 02:00 PM and 03:00 PM hours are smaller than other hours. Glancing back at the XY scatter plot, can see the thick band of measurement data is more tightly packed. Last, want to give a fair warning when looking at these types of charts: The amount of the data will generally affect the height and patterns of the lines and bars. Do not be caught off guard if, for example, the Arithmetic Mean average is always above your middle range. This is a function of the amount of data. 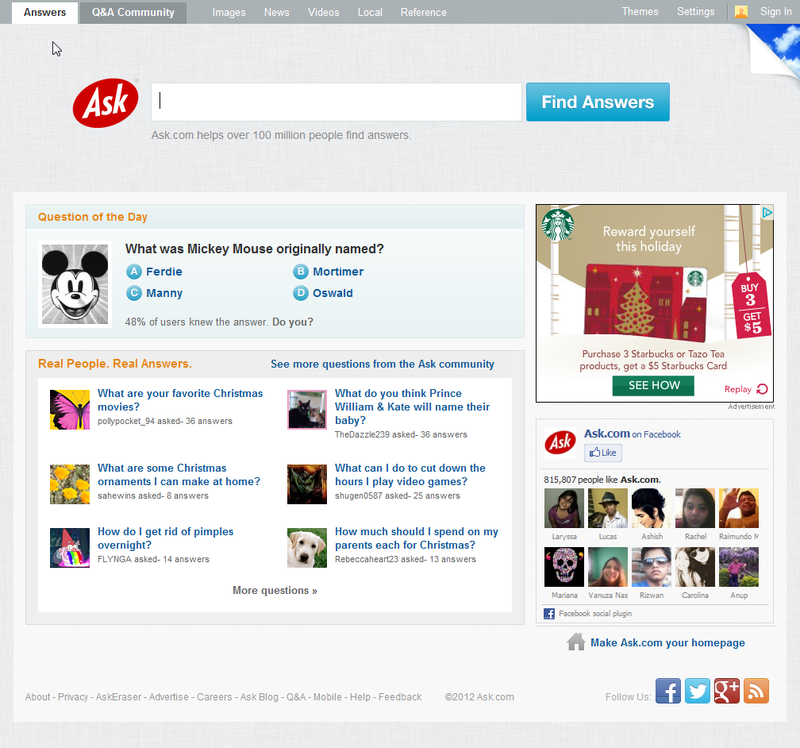 What Are Your Website’s Hot Times? Hello! This #WebTortoise post was written 2012-JUL-12 at 11:56 AM ET. 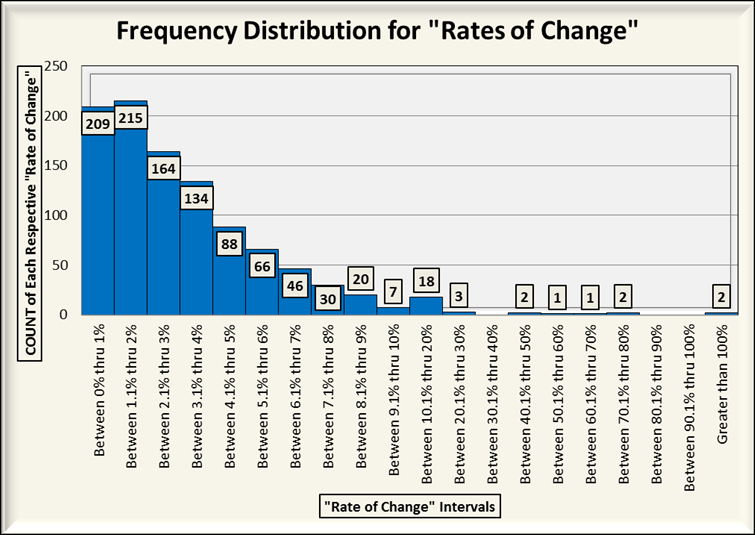 ==> Use color to add value to your Performance charts. In this Heat Map example, web site’s Performance data is overlay with color, where red means “slowest” and green means “fastest” (with various color grades in between). I added this Heat Map example because the chart data was difficult to “crunch”, to analyze for patterns; adding color made this easier. Download the Excel sheet here. Otherwise, see the below “Before” and “After”. 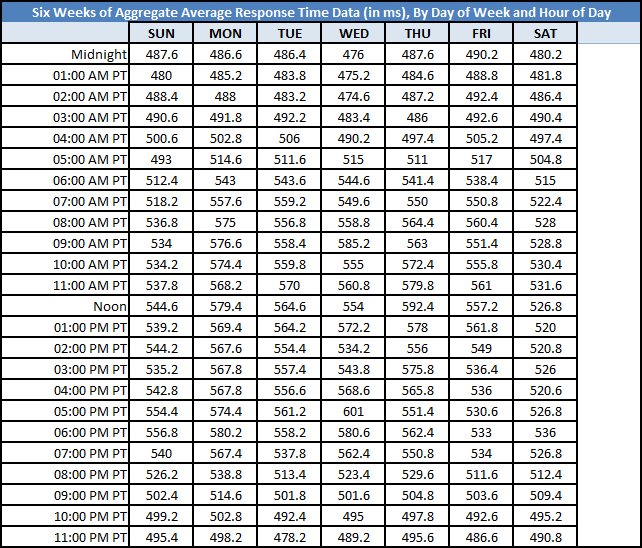 The chart data is the arithmetic mean average of six weeks’ worth of web site response time measurements (in milliseconds), broken down by Day of Week and by Hour of Day. I then used Excel’s built-in /Conditional Formatting/Color Scales/Red – Yellow – Green Color Scale/. 01. The weekends are the “fastest”. 02. The weekdays are the “slowest”. 03. 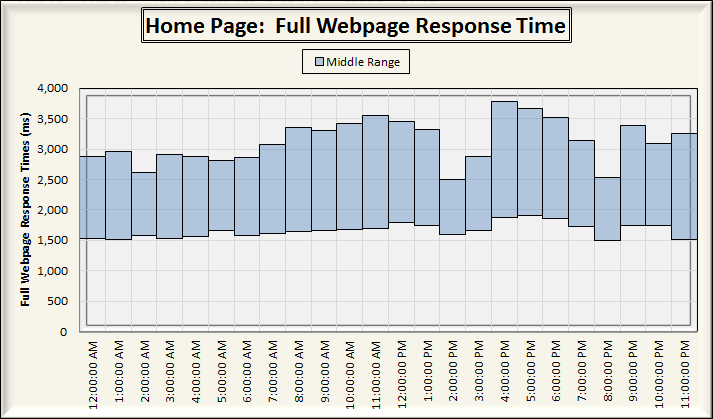 Response Time slows starting at around 07:00 AM PT and Response Time speeds starting at around 07:00 PM PT. 04. The “slowest” (i.e. 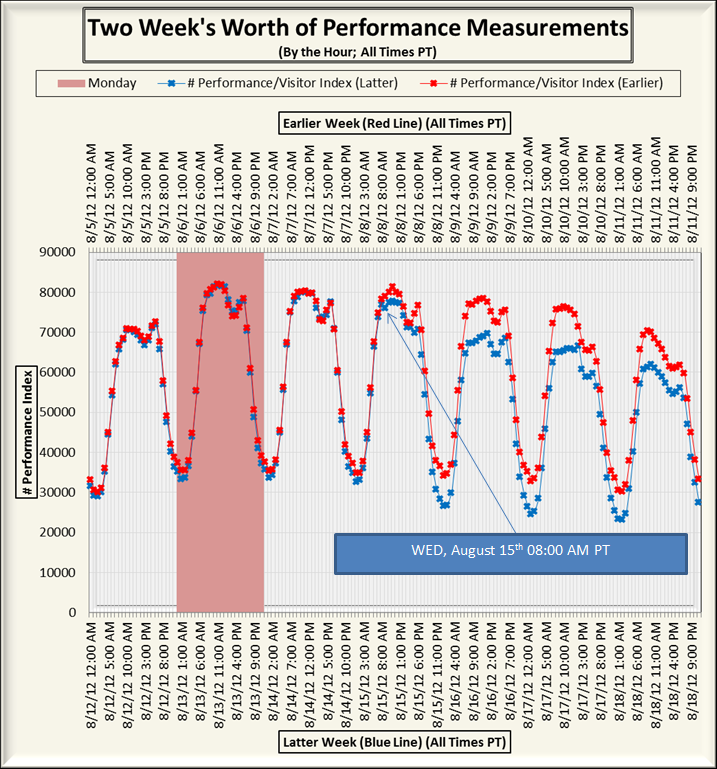 the most red) “Day of Week”/”Hour of Day” combination is Wednesday at 05:00 PM PT. 05. The “fastest” (i.e. the most green) “Day of Week”/”Hour of Day” combination is Wednesday at 02:00 AM PT. 06. Interestingly enough, the “fastest” and “slowest” “Day of Week”/”Hour of Day” combination was on a Wednesday. 07. Friday afternoons were “faster” when compared to other weekday afternoons (insert comment here RE: folks getting ready for the weekend! ).